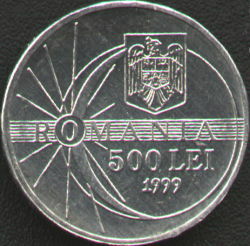 Obverse: ROMANIA written above a field of 7 horizontal lines, denomination "500 LEI", year 1999, Romanian coat of arms, the Moon covering the Sun. The letter O from ROMANIA is placed over a disk representing the maximum phase of the eclipse, several rays of light being visible. 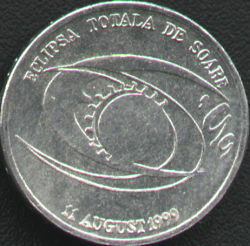 Reverse: ECLIPSA TOTALA DE SOARE 11 AUGUST 1999 meaning TOTAL SUN ECLIPSE, the Moon over the Sun and two shade cones representing the beginning end the end of the eclipse. The shade cone on the left has the shape of letter E, so on the coin appears E'99, the symbol of the eclipse. This is the only homage, anniversary or "special" Romanian coin to go into circulation up to the present date (September 2010) since 1906. This coin was issued to celebrate the total solar eclipse that took place on August 11th 1999. The rare event was popularized in 1999, especially because the total eclipse area covered a large region of Muntenia and Banat. In Moldavia the eclipse of 1999 was only partial. 4.000.000 such coins were struck, plus 3.000 more in like proof quality for numismatists. The pictures of the like proof coin above appears on the site thanks to the kind permission of Mr Cristian Ciuplea. Unfortunately, the National Bank of Romania did not issue (up until now, in 2010) any other commemorative coins for circulation. In our opinion, the circulation eclipse coins were well reveived by the general public as well as by the collectors and the "eclipse experiment" was a success - such numismatic issues should have been continued. A rhombus separates the three words ROMANIA incused on the edge. The small diagonal of the rhombi is vertical. 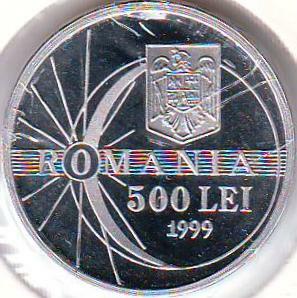 The edge is similar with the edge of the regular 500 lei coin (featured on the previous page). 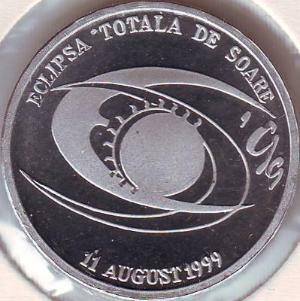 Click here to see to medals struck for the solar eclipse frenzy that caught Romania in 1999 (the eclipse taking place on August 11th).